Built as a buoy-laying vessel under yard No 113 by the Neue Jadewerft, Wilhelmshaven, Germany for the German Government (Wasser-und Schifffartsamt). Launched as the KONRAD MEISEL. Tonnage 486 grt, dim. 48.80 x 9.60 x 3.75m. (draught) Length bpp. 44.3m. Powered by two Deutz diesel engines, 750 hp, speed 14 knots. 1998 Sold to South African Government and renamed ISIBANE. 2000 Sold to Zonnekus Mansion Pty. Ltd, Panama City not renamed. 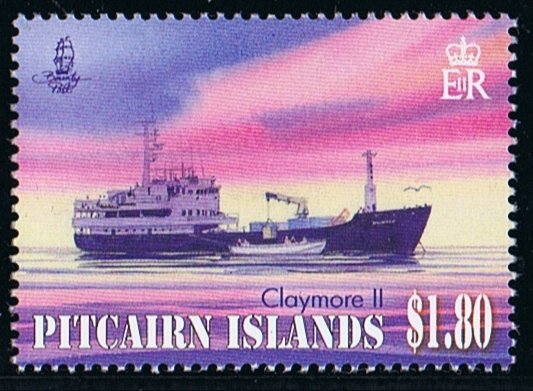 August 2009 sold to Stoney Creek Shipping Co. Ltd., Tauranga, New Zealand renamed CLAYMORE II. 17th August arrived at Tauranga from South Africa. 07 September 2009 registered as a cargo vessel in Tauranga. She is contracted for 4 scheduled voyages each year from New Zealand to Pitcairn Island to carry supplies and cargo to Pitcairn, and passengers to and from the island each year from Mangareva on the Gambier Islands, French Polynesia to Pitcairn Islands, each year 8 trips are scheduled, the passage between Mangareva and Pitcairn Islands takes around 32 hours. She has accommodation for 12 passengers. In between the Pitcairn charters she is available for other charters. 2011 In service same name and owners. IMO No 6815691. Pitcairn Island 2011 $1.80 sg?, scott?